From the moment developers of the Wilshire Grand project downtown publicly disclosed their intention to wrap the buildings in a 300,000 sq. ft. electronic skin that would display colored, changing images, including commercial ads, some people have raised alarms about the possibility that approval would undermine enforcement of the city’s general ban on new off-site advertising. While that possibility scarcely registered in City Council meetings on the project that more closely resembled pep rallies than debates, it came through clearly last week in a filing in the 9th Circuit Court of Appeals alleging that approval of the signage is an unconstitutional exception to the ban. Attorneys for the plaintiff in the case, Vanguard Outdoor v. City of Los Angeles, are appealing a lower court ruling that denied the company an injunction to stop the city from enforcing the off-site sign ban at three sites where large supergraphic signs were draped across buildings. The attorneys have claimed that numerous sign ban exceptions allowed in Hollywood, downtown, and elsewhere undermine the expressed purposes of the ban, primarily to combat visual blight and enhance traffic safety. In the April 19 filing, Vanguard attorneys cite the fact that a sign district established to allow the electronic signage is contrary to those purposes because it exempts the signage from two provisions in the city signage ordinance relating to traffic safety. One provision requires the city’s Department of Building and Safety to deny a permit to any sign deemed a hazard by the Department of Transportation. The other prohibits any sign within 2,000 ft. of freeway if the Department of Building and Safety determines that the sign is primarily viewable from the roadway. Some of the 30,000 sq. ft. of electronic signage displaying off-site advertising will be visible from the 110 freeway less than a block to the north of the project. The City Planning Department had recommended that almost all the freeway-visible signage be disallowed, and the City Planning Commission agreed, but the developer appealed to the City Council, which restored the signage originally proposed. Last week’s filing asks the appeals court to take “judicial notice” of those exemptions, as well as statements made by City Council members at its March 29 meeting, and at a March 1 meeting of the Planning and Land Use Management committee. Among those cited statements were Tom LaBonge saying that “sign districts are appropriate where they are appropriate,” Dennis Zine saying that if any problem arose from approval of the sign district “we can fix it,” and Jan Perry saying that the sign district should be approved because the city had negotiated a valuable community benefits agreement with the developer. 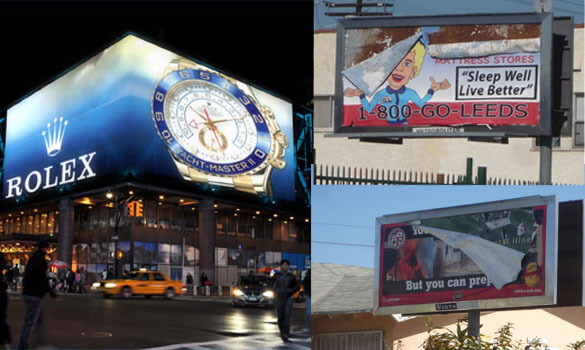 The South L.A. part of Perry’s district is home to a number of badly-deteriorated billboards, many owned by Lamar Advertising. See Lamar Advertising: Blighting L.A.’s Poorest Neighborhoods. A three-judge panel is scheduled to hear oral arguments in the Vanguard case on May 2 in Pasadena.